MOHEGAN INDIAN RES. - Diana Taurasi has never acted her age in her life. She was 21 going on 40 when she stepped on the court for the UConn women’s basketball team. Now at 36, the veteran Phoenix Mercury guard and WNBA all-time leading scorer plays like she 26 with a bounce in her step, a joy for life, and a passion that does not waver. While she didn’t have much fun in Dallas Tuesday night when she played just four minutes due to illness in a loss to the Wings, Taurasi is winning the battle against Father Time much like she’s won so often at the college, professional, and international levels the past two decades in a career that will finish with her induction into the Naismith Memorial Hall of Fame in her first year of eligibility following her retirement. Even with limited playing time in her last outing, the Chino, California, native is seventh in the WNBA in scoring (19.6) and sixth in assists. How many other players are in the top seven in both categories? None. “I take it week by week, year by year,” Taurasi said. “My measuring stick on whether I want to be on the court or not is whether I want to compete or not. Part of the reason she’s feeling healthy is she did not stay overseas last offseason. After one month in Russia, she returned home. But it wasn’t like she wasn’t busy. 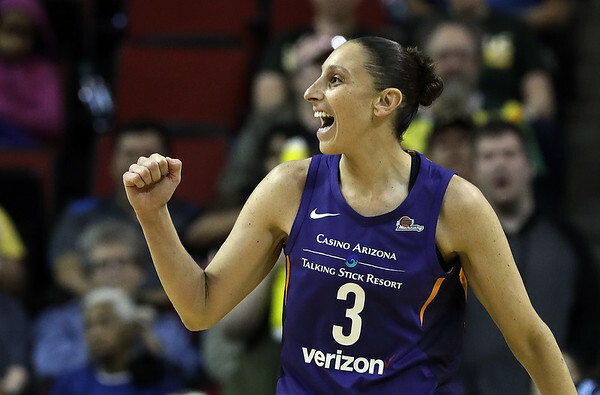 In May, Taurasi and her wife, former Phoenix teammate Penny Taylor, celebrated their first wedding anniversary and did so with their first child. Taylor gave birth to son, Leo, on March 1. For almost two decades, basketball fans in Connecticut have watched Taurasi grow up. She was UConn’s second three-time All-American and first two-time national Player of the Year, guiding the Huskies to three straight national championships. The final two in 2003 and 2004 were won without an All-American as a teammate. The Huskies have had at least two WBCA All-Americans on their other nine NCAA title teams. But she was just getting started. After being the No. 1 pick in the 2004 WNBA Draft, she’s led Phoenix to three WNBA titles. She also owns four Olympic gold medals and three FIBA world championship gold medals playing for USA Basketball, along with numerous titles overseas. Her fire has never flickered. “It’s innate,” Taurasi said. “You meet a lot of people that are passionate and you meet a lot of people and you’re like, ‘Why are you even out here?’ Maybe it’s the people you’re around, your family, the culture. Entering tonight, Phoenix is 14-7 and in second place behind the Seattle Storm (15-6) in the Western Conference and overall standings. The top eight teams overall make the playoffs with the top two teams receiving byes to the best-of-five semifinals. The Mercury won two single-elimination games each of the last two years to get to the final four. They’d like to do a little less work come playoff time this summer. In late September, Taurasi is expected to take part in her fifth world championships when the FIBA World Cup is held in Spain. USA Basketball has been a part of her life since she made her first team in 2000 - a U-18 squad coached by Geno Auriemma. “There is the honor of playing USA Basketball, the pride of playing for your country, a responsibility to do it if you can still play at that level,” Taurasi said. She should be joined in Team USA’s backcourt by her former UConn teammate Sue Bird, who is 20 months older. “Sue’s the best point guard in the league. She’s the best point guard in the world. Why shouldn’t she make it? Taurasi said. Ten of the 12 players from Team USA’s gold-medal winning 2016 Olympic club are still part of the national team pool. By the time the Tokyo Olympics come around in 2020, only ex-UConn standout Breanna Stewart and Brittney Griner will be in their 20s from the 10 holdovers. There will be new blood, but how much? After the World Cup, Taurasi said she’ll take a family vacation in Barcelona and enjoy life at home with Taylor and baby Leo. She also plans to attend a UConn football game in the fall, saying with a laugh, “There’s a big game against Temple.” She hasn’t been to Rentschler Field since 2004. But she still pays close attention to Auriemma and his Huskies. Even before Thursday she had already heard how incoming freshman guard Christyn Williams predicted that UConn would win the 2019 national championship. Phoenix’s appearance at the casino tonight is its only one of the regular season. But don’t worry. The good news for basketball fans everywhere is that Taurasi has no plans to go anywhere for awhile. “I love coming back here,” Taurasi said. “I get to see a lot of familiar faces and friends I went to school with. I catch up with Coach Auriemma and his family. Not when she’s having the time of her life. Posted in New Britain Herald, UConn on Friday, 13 July 2018 21:04. Updated: Friday, 13 July 2018 21:14.